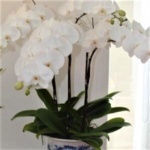 We specialize in bringing you a wide range of highest quality orchid flowers. Check out our orchid leasing plan where we deliver fresh perfectly blooming orchids to your home or business weekly to add a new level of elegance to your space. Looking to rent orchid flowers for an event? Need a display filled with orchids for a lobby, conference, or special event? We have the solution!